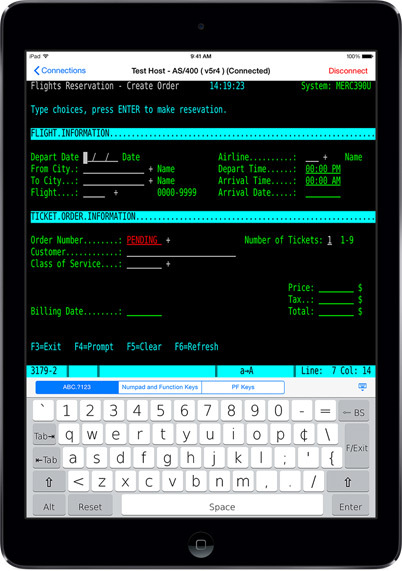 Comprehensive Enterprise Grade Terminal Emulation Apps for iPad. 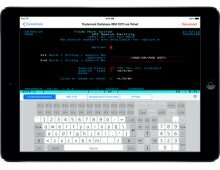 TTerm is Turbosoft's all new terminal emulation application for iPad®, offering comprehensive terminal and language support, support for Apple wireless keyboards, custom hotspots for touch interaction, multi-session capability and a variety of other features designed to enhance terminal emulation on your device. TTerm builds on the proven quality, accuracy and range of emulations that our Windows® product TTWin is renowned for. A number of TTerm apps are available, each differs only in the terminals it supports. TTerm is an enterprise grade terminal emulator providing secure, robust communications to UNIX hosts over SSH and telnet. TTerm Plus supports all terminals and features in TTerm with additional support for IBM AIX terminals, Wyse series terminals and ADM 11 emulation. TTerm 3270 supports IBM 3270 and Fujitsu 6681 terminal emulation for IBM host connectivity. TTerm 5250 supports IBM 5250 terminal emulation for AS/400 (iSeries) connectivity. TTerm Pro provides the maximum terminal coverage with support for over 80 different emulations including all those in TTerm, TTerm Plus, TTerm 3270 and TTerm 5250. For a detailed list of the terminals supported in each app select the Technical Specifications tab. Turbosoft can supply custom versions of TTerm catering to your particular needs at attractive pricing. Distribution is provided through the official App Store and the Apple Volume Purchasing for Business program. Contact Turbosoft for more information. TTerm Apps are available for download from the App Store . Hotspots add touch elements to legacy apps. 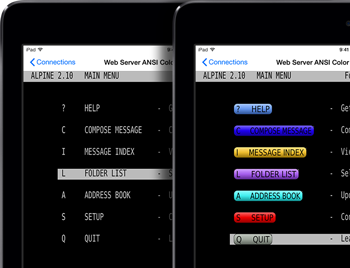 Supporting up to 80 terminals within the one app, over Telnet and SSH. Turbosoft has been developing terminal emulation software since 1988 and our emulations have been put to the test by thousands of users. Benefit from our experience with rock-solid, accurate emulations. Secure communications to your host including Telnet via SSH tunnel, Telnet via SSL2/SSL3/TLS and support for importing SSH keys. For 3270 users Express Logon Feature (ELF) is supported. Connect to multiple hosts, simultaneously. Switch between active sessions quickly and easily. Restricted mode protects important configuration settings from unwanted scrutiny. 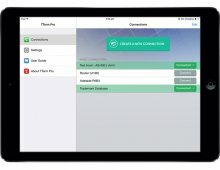 Kiosk mode locks down TTerm completely, restricting users to the connection options you configure and provide. Looking to configure and deploy multiple devices in a school, business or institution? Configure once and use built in import/export tools to make your job easy. For organizations utilizing Mobile Device Management software such as MobileIron® or Airwatch® TTerm supports configuration deployment allowing administrators to push configurations directly to end user devices. Make your host session finger friendly with ease. Add touch friendly Hotspots to your terminal screen in fixed positions or dynamically in response to screen content. Easily attach complex actions to each Hotspot. 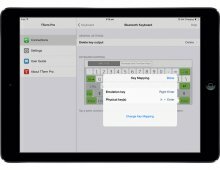 Custom on screen keyboards supporting multiple languages and layouts, designed for touch screen usage. 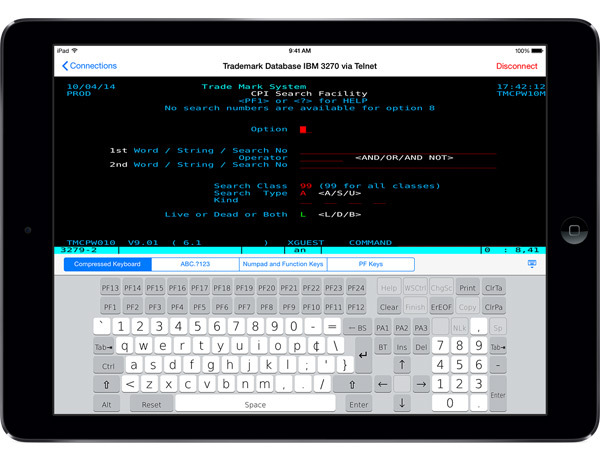 For heavy duty users, TTerm supports Apple Wireless (bluetooth) keyboards. 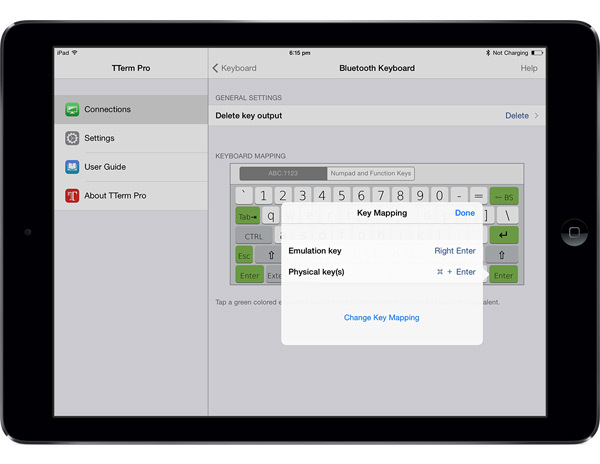 Remap and customize bluetooth keyboard input. TTerm is an intuitive, easy-to-use terminal emulator designed specifically for the iPad. Options for organizations both large and small to manage TTerm configuration and deployment across multiple devices.